The next installment of David Lynch’s Festival of Disruption has been announced. 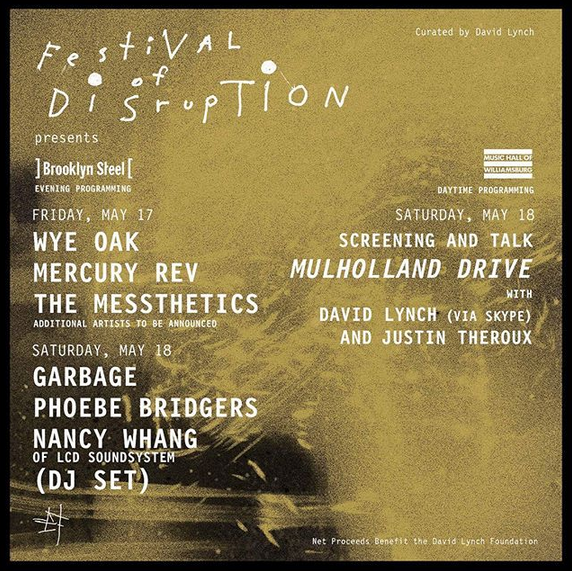 It takes place May 17 and 18 at Brooklyn Steel in Brooklyn, and the lineup will include Garbage, Wye Oak, Phoebe Bridgers, Mercury Rev, The Messthetics, a DJ set from LCD Soundsystem’s Nancy Whang, and more artists yet to be announced. There will also be a screening of Lynch’s film Mulholland Drive, along with a discussion of the film with actor Justin Theroux and Lynch himself (via Skype). Tickets are on sale now. The show is being presented in partnership with Bowery Presents, and net proceeds from the weekend fest will go toward the David Lynch Foundation, which aids people suffering from post-traumatic stress with transcendental meditation therapy. Read our feature, Welcome to the Black Lodge: The music of David Lynch in film and television.